I remember my parents exchanging through the mail these little 3-inch reel-to-reel audio tapes while my dad was flying into and around Vietnam. He was a navigator on a C-130 Hercules cargo plane during the war there. As a father now myself, I often wonder what it must have been like for him, to hear my tiny little voice for the first time that way. 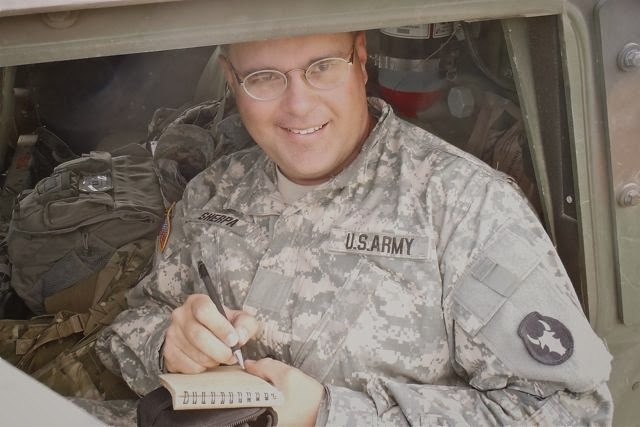 When I got word in 2009 that I was soon going to deploy to Afghanistan, I decided that I would start a journal — in part, because I wanted to leave behind my own time capsule, my own snapshots, a version of my own set of audio tapes. I also wanted to be able to one day explain to my children — after they got older, of course — just what was so darned important that I had to leave them and their mom for a whole year of their young lives. 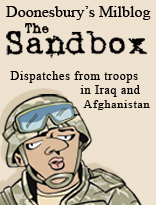 I published those journal entries on the Internet, as a military blog. I was a citizen-soldier, and my Army job involved technologies such as blogs and social media. My bosses in uniform kept asking for my opinions, and I needed some first-hand knowledge. I figured that there's nothing like learning by doing. Besides, it's always better to ask forgiveness than to ask permission, right? Still, because Army attitudes and policies about bloggers were mixed at the time — indeed, that's why my bosses kept asking for well-grounded opinions — I started writing under a pseudonym. And, as a further experiment in organizational awareness, I didn't tell my bosses about the blog. It was only months later that some of my buddies figured it out, after they recognized a story in which they'd been involved. What I didn't realize at the time was that I was also creating a useful persona — one that didn't let politics, bad jokes, or rank get in the way of telling good stories. "Charlie Sherpa" wasn't out to get anyone in trouble, or to laugh at anyone's expense but his own. To my surprise, I also found that many of my readers were spouses and families. "My husband doesn't tell me about his day when he gets home from training," one reader wrote. "Thanks for helping explain what he may be going through." After years of making physical, mental, spiritual, and legal preparations for Afghanistan — and just days before the unit was to leave — I got bumped off the deployment. I decided to stay on the figurative roller coaster, however. I would continue to write a journal, for my buddies, their spouses, and their kids. I followed the Iowa unit as a citizen-solider, and later as a civilian writer, to Mississippi and California and then to Afghanistan. I'm still writing today. That shouldn't come as a surprise. You see, parallel to my 20 years with the National Guard, I was also a newspaper and magazine editor. I'm now a freelance writer. I even have a specialty, backed up by a graduate degree in architectural studies, in writing "how to" articles about architecture, home remodeling, technology, and neighborhood planning. That's the reason my former commander used to joke about me writing for "Better Hootches and Gardens." 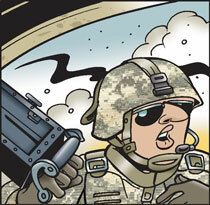 In my military career, I was an Army communications guy. Not public affairs — that's something else. I was all about radios and computers. On weekend drills and active-duty deployments, I was a messenger, rather than media. Late in my time with the military, however, I fell into a couple of longer-term but temporary active-duty gigs as a "lessons-learned integrator." I was, in effect, a "how-to" writer for Uncle Sam, part of the first state-level National Guard lessons-learned integration ("L2I") team. My teammate was an Army-trained broadcast journalist. Our mission was to "document and disseminate lessons from deploying and deployed soldiers," in order to inject them back into our state's training efforts. In a fantastic display of laissez-faire leadership, our bosses even empowered us to invite ourselves to any meeting or training event we thought would be relevant. We called the team "L2I Iowa." The Army Center for Lessons Learned ("CALL") at Fort Leavenworth, Kansas, even adopted us as their own. We were an Army of Two. A "lesson-learned" is knowledge gained from experience that results in a change to organizational or individual behavior. "Lessons-learned integration" is the practice of sharing with others that knowledge you've gained from experience. So they don't make the same mistakes you did. And so that we multiply our collective successes. So, after five years of blogging, including a short stint as civilian media embedded with my old unit downrange in Eastern Afghanistan, here's some knowledge gained from experience, put down on paper and the Internet. The usual L2I caveats apply, of course: "Every story is a sample of one. Your results may vary. Take what advice you need, leave the rest." Lesson No. 1. Blogging is journalism. A "blog" is an on-line journal. The words "journaling" and "journalism" share not only a root, but an objective: Document the facts and funnies of the day. Regardless of whether you lock it up in a diary under your bed, or publish it to the World Wide Web, or print it in a newspaper, all that matters is the standards to which you hold yourself as a writer. There are good reporters, and there are bad reporters. And you don't need to call yourself a "journalist" to be a good reporter. Just remember Sherpatude No. 3: "Never speak with complete authority regarding that which you lack direct knowledge, observation, and/or suppressive fires." Lesson No. 2: Every deployment is a story. Every story has a beginning, a middle, and an end. There's a quote attributed to John Paul Vann, who served as a both a military and civilian adviser during the Vietnam War: "We don't have twelve years' experience in Vietnam. We have one year's experience twelve times over." I think about that quote a lot, but I apply it to Afghanistan. The Iowa National Guard deployments I helped document in 2007 were not the deployments of 2010. Those earlier deployments involved 16-soldier teams of "embedded advisers," who were spread out and partnered up with Afghan troops and police. That whole "advise and assist" theme coming out of Afghanistan today? The National Guard started doing that job in 2003. By 2010, however, the Iowa National Guard was preparing to send 3,000 citizen-soldiers to Afghanistan as one unit. Army news releases noted it was "the largest deployment of Iowa citizen-soldiers since World War II." 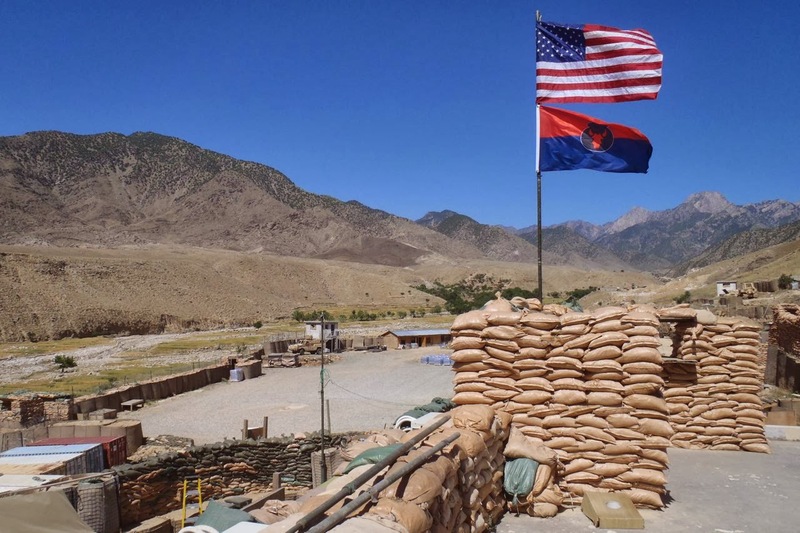 Iowa's 2nd Brigade Combat Team, 34th Infantry "Red Bull" Division (2-34th BCT) arrived in Afghanistan to relieve Vermont's 86th Infantry Brigade Combat Team. Oklahoma's 45th Infantry "Thunderbird" BCT arrived to replace the Red Bull. In each case, state and local media in those states told our respective deployment stories: Beginning, middle, and end. Then, the war moved on. Afghanistan was a moveable feast. We haven't fought 13 years of war in Afghanistan. We've fought 13 different wars, a year at a time. The news media hasn't covered 13 years of war in Afghanistan. We've covered the war one state at a time, one unit at a time. 3. Everybody has their own war. "A hero goes on a journey." "A stranger comes to town." I think a deployment is a combination of the two: "A hero goes on a journey" ... but "a stranger comes back." No, I'm not arguing that all veterans are somehow broken, or crazy, or a potential danger to themselves or others. Military experience, however, is like any major life experience. It changes people. Sometimes, that's a good thing. Sometimes, it leaves scars. And, if you want to write about war, you have to write about those changes. 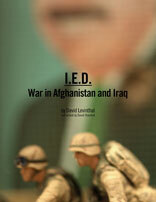 Why did we go to war in Iraq, or in Afghanistan? In the absence of a grand strategic narrative from our national leaders — or reported context from our media — our veterans are left to answer the question of what their war was all about. A hero goes on a journey, a stranger comes to town, and he or she spends the rest of his days trying to figure what it all meant. "Everybody has their own war" has become a personal mantra. It's a good reminder to be humble, and to first do no harm — whether in your writing, or your everyday actions, or even just listening to people on social media. Everyone's experiences downrange, after all, were different. Everyone left back at home had experiences, too. We need to listen to each other, regardless of age, gender, color, branch of service, or military job. Because, while everybody has their own war, people shouldn't have to fight theirs alone. 4. Homecoming is a journey, not a destination. My journey to Afghanistan may have had an end, but the story didn't stop there. I thought I would pack up my body armor and helmet, write my blog (and perhaps a book), and move out smartly. Instead, I've found myself repeatedly returning to veterans issues and military themes — sometimes, in ways that surprised me. Some of my words, for example, have been published and republished in venues such as Doonesbury's "The Sandbox," and the Southeast Missouri State University Press "Proud to Be: Writing by American Warriors" anthologies. 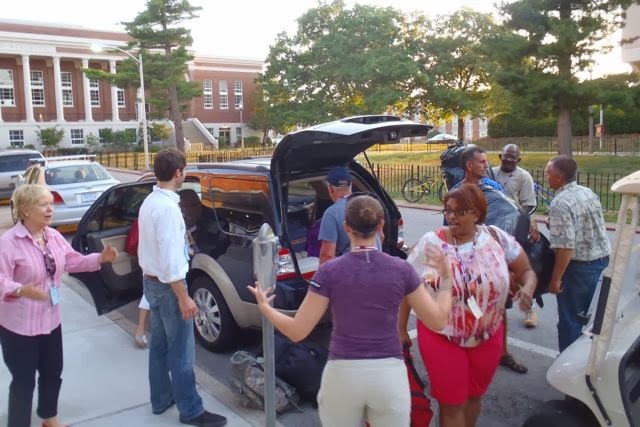 A 2012 Military Experience and the Arts Symposium on the campus of Eastern Kentucky University, Richmond, was a lightning rod for meeting other veterans and military supporters engaging in creative work. I've also participated as a cast member in a theatrical production of The Telling Project, in which veterans and military family members from all eras shared their own stories of service and sacrifice. Finally, during the annual Iowa Remembrance Run, I've been humbled to read aloud the names of those Iowans who have given their lives during the wars in Iraq and Afghanistan. (Four were "Red Bull" soldiers who deployed in 2010-2011.) Some day soon, I hope, we'll be able to stop adding names to that list. Meanwhile, there are more and more literary publications focusing on military-themed writing, whether from veterans or others. The telling of our stories is just beginning. "A lesson is knowledge, gained from experience." Share yours. Or, like the Red Bull says: "Attack! Attack! Attack!" Over the past four years Charlie Sherpa has contributed over 30 posts to The Sandbox, including Not In Front Of The Kids, Scenes From A Send-Off Ceremony, Coming Home On A Bungie Cord, We Apologize For The Inconvenient, The Sherpatudes, and Boonie's Haiku Contest.